This episode features the Nova Scotia based folk duo The Bombadils. The duo is Edmonton born Sarah Frank and Halifax born Luke Fraser. They met as classical music students at Montreal’s McGill University. 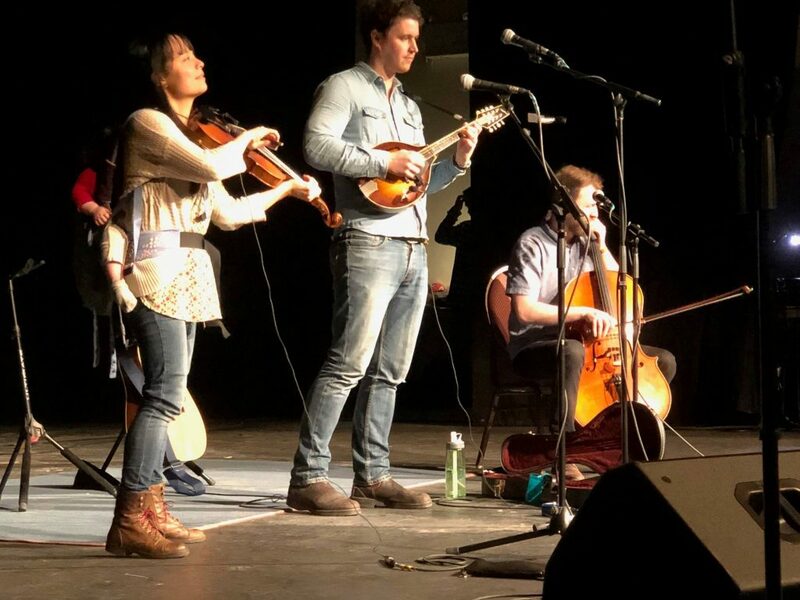 Shortly after graduating in 2012 they changed musical direction to form The Bombadils focusing on Irish and Scottish folk music, Appalachian and bluegrass traditional tunes. And if that name Bombadil sounds familiar it’s probably because you’re thinking of J.R.R. Tolkien’s “Lord Of The Rings” character. Sarah and Luke tell us they actually chose the name from a song titled “House of Tom Bombadil” by American composer Chris Thile who has been one of their major influences. Luke and Sarah create beautiful harmonies layered on enchanting melodies by re-imagining old folk songs, poetry, and original songs, into a new folk framework. Luke’s guitar, mandolin, and vocal harmonies are an ideal counterpoint to Sarah’s sweet yet powerful voice and fiddle. Among many achievements The Bombadils have won Folk Music’s Ontario’s “Recording Artist Of The Year Award” in 2017 and have released 3 CDs. We recorded the duo at the Kluane Mountain Bluegrass Festival in Haines Junction, Yukon, in June 2018. For this performance Luke and Sarah are ably supported by Eric Wright on cello. As a member of the Canadian folk group “The Fretless” who won the 2017 Juno Award for “Instrumental Album Of The Year” he rounds out their sound beautifully. We would like to thank the Yukon Bluegrass Music Society for their support making this recording possible.